As more states enact stricter air quality regulations, the term “VOC” is becoming a greater part of our everyday vocabulary. But what exactly is a “VOC”? VOC is an acronym for Volatile Organic Compound. That’s a mouthful, but what does it mean? VOC’s are carbon based (organic) solvents that evaporate (volatilize) under normal atmospheric conditions and have the ability to photo-react when exposed to sunlight. This reaction creates low-level ozone, a major component of smog. Smog is associated with causing asthma, bronchitis, and emphysema. Smog poses a health threat to the young, elderly, and those suffering from cardiovascular disease. And as anyone who has flown into some major metropolitan cities (like Los Angeles) can attest, smog is a real problem for everyday citizens. As a result, many states have enacted strict VOC regulations, limiting the level of photo-reactive solvents manufacturers can use in coatings. These states have also published a list of VOC “exempt” solvents that have limited photo-reactivity, and do not contribute to smog formation. Unfortunately, VOC exempt solvents are not as user friendly, are associated with conditions such as fast evaporation and bubble formation, and increased product costs. Every coating manufacturer is limited to the same exempt solvents. If it doesn’t appear on the list, it isn’t VOC exempt. VOC’s are measured in grams per liter (g/L), and the Federal limit for cure & seals is 700 g/L. Various states and groups of states, including California, the Ozone Transport Committee (OTC) states, the Lake Michigan Air Directors Consortium (LADCO) states, and Canada have enacted more restrictive VOC limits of 350 g/L for cure & seals (400 g/L for sealers). These limitations impact all paints and coatings, not just cures & sealers. The fines and criminal penalties for use of non-compliant products are substantial, so it’s imperative that you know what products can and can’t be used in your state. Make certain the product you intend to use is VOC compliant within the state it’s intended to be used. This is particularly important if you’re traveling to a remote jobsite in a state whose VOC laws you may not know. Low VOC coatings often require different application techniques. Call or write the ChemMasters’ technical department for a complete list of VOC limitations in your state, or if you have any questions about which ChemMasters product is compliant. Crystal Clear-A is premium quality, super high gloss, non yellowing, curing and sealing compound. Crystal Clear-A is a state-of-the-art proprietary formulation which creates the highest gloss possible on concrete. 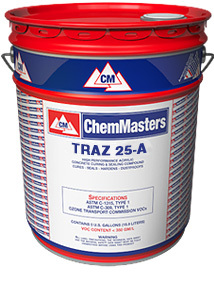 Spray-Cure & Seal 25-A is a styrene acrylate copolymer, membrane forming curing and sealing compound for concrete. Silencure-A is a solvent-based, pure acrylic copolymer curing and sealing compound for concrete. Polyseal™ A is a high solids, high performance concrete curing and sealing compound. This state-of-the-art proprietary formulation completely resists discoloration from ultraviolet light exposure, creating a glossy membrane which remains clear throughout its service life.